We’ve undergone a recent remodel here at our central offices in Minneapolis. It’s easy to get caught up with the interior of our office, so we committed to appreciating our outdoor space. 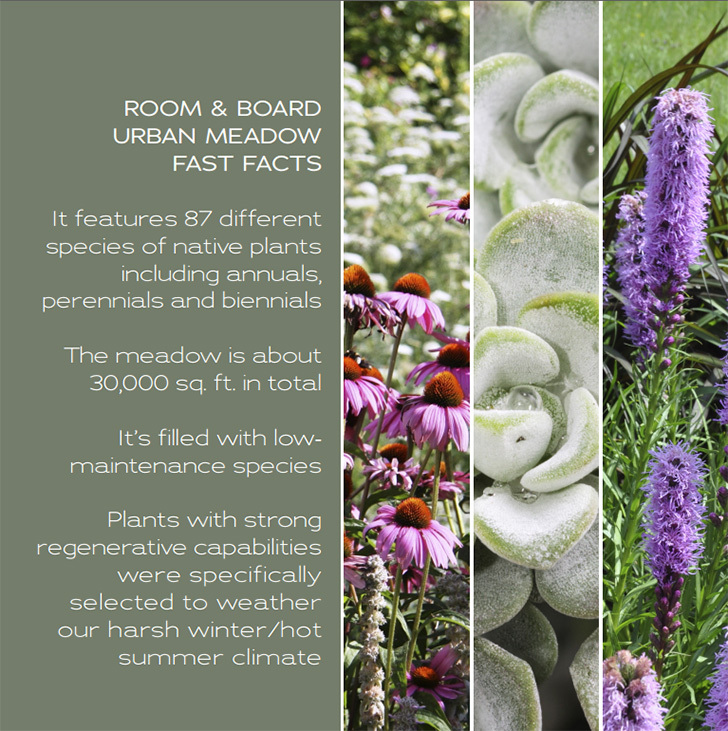 So we partnered with local company Urban Ecosystems, Inc. to develop an urban meadow onsite. An urban meadow is an organized ecosystem featuring a hyper-diverse population of native flowers and plants, specifically grown in a metropolitan area. They’re popping up everywhere from just outside our walls to rooftops in New York and large parks in London. Our urban meadow is filled with native plants that are dynamic between seasons, with a “bloom sequence” that typically runs from April through October in our Minnesota climate. So, flowers and plants of all sorts will bloom with zero-to-little maintenance throughout those six months. Our meadow began germinating in late May and we are beginning to see some green, textural growth and smaller flowers, with substantial growth expected next spring. A low-input lawn helps frame the meadow and keeps the plants from looking too jungle-y. We also installed a grid-like, jute fiber on the ground that keeps plants in place and helps create an ideal ecosystem. An added bonus: The jute fiber is 100% biodegradable. While this urban meadow is new to us, it’s not the first of its kind. 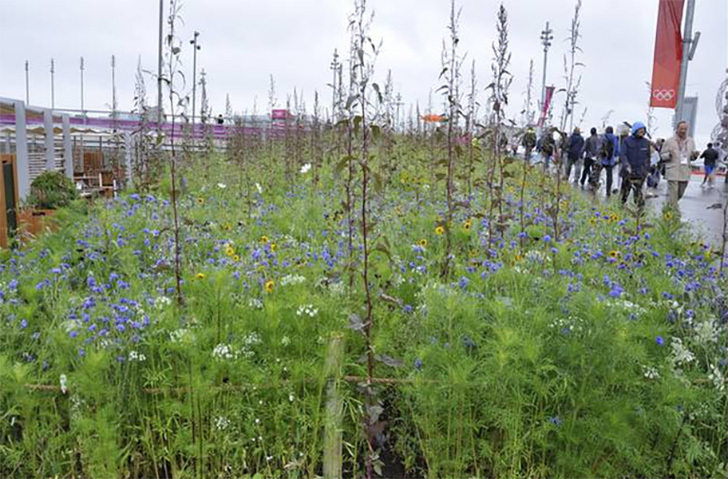 James Hitchmough of Sheffield University headed up the world’s first and largest urban meadow at Olympic Park in London. We can’t wait to watch our meadow grow. And at 30,000 sq. ft., makes it the largest urban meadow in North America. Track the changes with us on Instagram, Facebook and Twitter to see our meadow in the making. 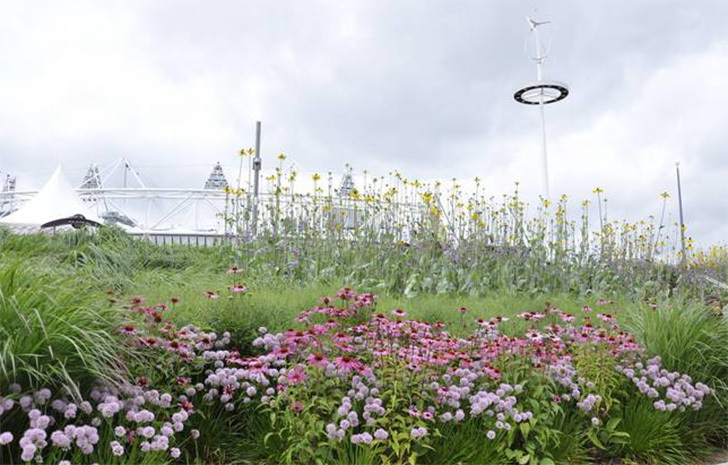 The world’s largest urban meadow is located in Olympic Park in London. Side note: Are your summer travels bringing you near southern Minnesota? Our lead landscape architect Michael suggests checking out Prairie Moon Nursery in Winona if you’re looking for a variety of good seeds.